The snow had melted. Fields and forests were black as ink. The whole visible world was saturated with moisture, exuding a cold, dank vapour. The backdrop to The Lodger is a dismal, wintry Belgium. First Brussels, then the bleak mining town of Charleroi, where the protagonist, Elias Nagear, holes up in a dreary boarding house to evade capture after committing a brutal murder. What happened next was so grotesque that he felt like breaking into hysterical laughter . . . Elias struck again, twice, three times, ten times, infuriated by those mild insensate eyes staring up at him. He stopped only when his arm grew tired and he hadn’t the strength to raise [the spanner] again. So here we have our hero – opportunistic, brutal, remorseless. Nagear’s presence in the household causes resentment among the boarders. He pays more rent and is thus entitled to bacon and eggs for breakfast and cutlets for dinner, while they eat bread and butter from their personal biscuit tins. But for the same reason, Mme Baron takes a maternal shine to him. However, it is as the various members of the household realise the identity of the newcomer that the flaw in the book becomes apparent: not one of them even contemplates giving him up to the police. Mme Baron at first asks him to leave, but when he does not do so, life continues as before, albeit in an increasingly strained atmosphere. Even when the police finally surround the house Mme Baron’s only reaction is to wonder if there anything she can do to aid Nagear’s escape. Were Nagear a charismatic or charming individual, this might be less unconvincing, but he is not. He is irritating and pompous, continually boasting about the virtues of his native country. 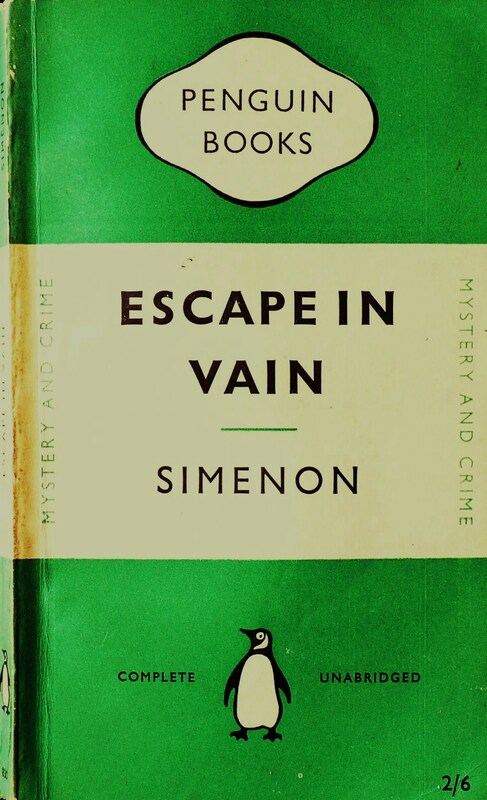 Nor does his behaviour in the household tally with the brutal murderer Simenon portrays at the beginning of the novel (at one point he thrashes around on his bed crying for his mother). There is a general lack of plausibility, although less in the portrayal of the individual characters than in their relations to one another. First published as Le Locataire, 1934. Translated by Stuart Gilbert and published by Penguin alongside No Way Out in the volume Escape in Vain in 1952.